Well crud. You might have noticed I hadn’t posted the past couple of weeks. Yeah, I figured I’d let my blog slide while I dealt with offline stuff. It’s the last day of January, and it would seem 2018 is following in 2017’s steps. I had an MRI last Wednesday, and I’ll find out next Monday if my wrist pain is caused by a cyst. Hopefully it’s something that simple, because according to the doctor, it’s an easy surgery with a quick recovery time. In the meantime, I’ve been rocking my situps and increasing the amount of weight I’m lifting. I’m up to 6500 lbs per session, having added in tricep extensions, bicep curls, dumbbell presses, and dumbbell swings, each at 10 lbs for 20 reps. If I keep the weights light, my wrist doesn’t bother me. Writing wise, I haven’t been doing so great. I’m a creature of schedule, and if something mucks with that (say skipping work to go get an MRI), then my productivity kind of goes down the drain. And there’s been a lot of mucking with schedules lately, thus my default has been disaster mode. I managed to get 680 words this past week, which is close to my 700 words-a-week goal, but still falling short of where I want to be. I also recently joined a facebook group. This was a gamble for me. I don’t do well in a setting that moves faster than I can keep up. But I figured I’d take the plunge and try to make some friends. 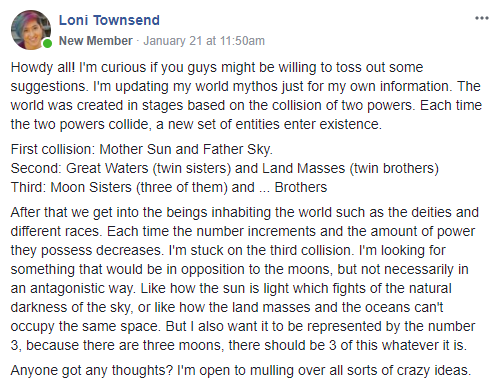 Cautiously, I joined the group, posted my greeting paragraph, and then later posted asking for specific suggestions regarding my mythos. Perhaps I could have been clearer. My brain gets pretty wild when it comes to checks and balances with regards to my world. It’s a scary place to be actually. The responses started out helpful, with planets and meteor impact sites. My creative juices bubbled with glee. And then I got a comment that sent me spiraling into an emotional torrent. Develop your world more fully and it may come to you. It wasn’t a rude comment. It wasn’t an attack. It wasn’t meant to be hurtful. But it felt like a slap in the face, and I didn’t take it well. It translated to “You clearly haven’t done enough thinking on this, if you are asking other people for suggestions.” I’m sure that wasn’t how it was meant. I can usually take critiques on my writing in stride. But when I get “advice” on what I personally need to do, I react negatively (as this example shows from 5 1/2 years ago). It’s a personal problem on how I perceive what’s being told to me, one I haven’t been able to overcome in years. But it does derail my joy in the creative process, which leads to me spinning my wheels over what’s been said rather than focusing on my story. I’m thinking it’d be for the best that I don’t try to interact with strangers in an open forum, and if I do, to keep it superfluous and impersonal. Of course, that negates my purpose for joining the group, which was to make friends with fellow fantasy authors. I think I’ll stick to blogs. On a positive note, Ken, who is in the group, did provide a suggestion that I ended up using. Comets! I’ve got the timeline for when they appear all worked out, including what their appearance means to the population, and even had the revelation that their last appearance coincided with when the humans destroyed their homeland. I’m calling them the Harbingers because every time they show up, it means something bad is going to happen. How do you react to advice? Can you recommend any fantasy author bloggers? Do you go crazy with your world mythos? I imagine I would have been stuck thinking about that comment for a long, long time. Like, it would just stop me and make me question everything I’ve ever done, writing-wise. I’m such a slacker when it comes to world-building anyway, I probably would have a major imposter-syndrome attack or something. Glad to hear you did get a helpful suggestion out of it. Hope your wrist pain is something simple! May February (and the rest of 2018) treat you better. Develop your world more fully… Yeah, that was a less than helpful suggestion. Your world seems developed already. It’s too bad you took that one to heart. Clearly the suggester had nothing to say but chose to contribute anyway. 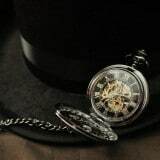 I don’t like to ask for advice in open forum that changes but it depends on whether they offer a solution or just slapping without adding something constructive. Generally, I take advice fairly well. Hope the MRI results are what you most want to hear. I imagine that comment came from a guy. He was just being blunt and simple, probably not hurtful. Good thing Ken is in the same group and gave you some tips. I hope you find out what’s wrong with your wrist and it’s nothing serious. I hope there’s nothing serious with your wrist. Generally, I’ll take comments like those as a “I don’t know what to say, but I’ll try to sound like I’ve wisdom”. I probably would’ve been far ruder in my reply than you, too. But then, I’m also a “if you can’t contribute constructively, then move on” sort of person when it comes to Facebook. That’s one of those times when you take a deep breath. Obviously the person didn’t know what to say but still wanted to comment. Three things? Too bad there are four seasons. Peace, hope, and love? The Trinity – Father, Son, and Holy Ghost? Maybe three precious metals or gems? Yay for that guy Ken. What a cool dude! I think helpful specific feedback is always best and I’m sorry you didn’t receive it. Yay for Ken though! My reactions to advice vary – sometimes, I take it all in stride, other times, I end up doubting myself or wondering why the other person didn’t “get” it. You just have to pick out the advice that’s useful and set aside the stuff that isn’t. Easier said than done, I know. Hope the MRI goes well. I get your vibe about keeping up with the blogging and the writing schedule. I need to seriously get on some kind of regimen. I don’t mind advice and I welcome suggestions, but if I strongly believe that I’m right about something then I politely accept the suggestions and advice but rarely follow through on them. Feedback is good especially if it makes a lot of sense and turns out to be useful. Some people don’t understand brainstorming. I love developing the mythos for my world, even though more than half of it will never be used. I hope the MRI goes well and it’s easy peasy to fix. I that my writing schedule gets easily disrupted, so I understand – plus the reaction to that Facebook comment. I find that people on FB rarely have time for proper comments that explain themselves properly. So I value the few that do take their time to write helpful comments. In the end, my beta readers are my best source of valuable comments – and I found those via the Insecure Writer’s Support Group on FB/Facebook. I *totally* feel you on the criticism. I take everything personally (and know I shouldn’t). I think it’s just a defense tactic because we love what we write soo much. I get it. I totally get it. I’m not sure what to suggest because I struggle with the same thing. But kudos to you for joining a new group and being brave. The last group I joined was this one, so at least you’re spreading your wings and working for your work. That’s awesome! Sorry to hear about the wrist. I hope that goes in the BEST possible way! Glad I was able to help. Asking for advice can be a double edged sword, just like reviews. Ignore the bad ones, enjoy the good ones. I agree with Ken’s advice on this. You have to take it with a grain of salt, especially when you don’t know the people. I’ve stopped looking for as much feedback because everyone will have a different opinion. You can’t please everyone. Hang in there, Loni! Take care of yourself, physically and otherwise. I hope the MRI goes as well as can be expected. I envy your weight-lifting efforts. So far I’ve gone to two strength-training classes at the Y and have done the full circuit on the Strive machines twice. I also tried TRX. My triceps really hurt! I tend to love advice. I don’t have to follow it, but hearing other views lets me know what works, what doesn’t, and what is truly and distinctly mine to call my own. As for Fantasy writers, my favorites have always been Mercedes Lackey and Lawrence Watt-Evans. Both fantastic by LWE captured my heart and soul with the Obsidian Trilogy. Lastly, I can’t say I’ve ever gone crazy with Mythos. The world just kind of…builds? I guess I’m weird when I admit that I’m sort of just along for the ride when it comes to my writing. All the same, I wish you luck on your wrist. I deal with regular pain in my back and have pretty much become a pin-cushion for my docs, so I really hope it’s something simple. Oog. I think that person was trying to be helpful, but they did it in such a generic way that made it seem like they hadn’t actually looked at what you posted. >_< That's a crappy kind of attempt at help, and I don't blame you for reacting like you did. I don't do well with comments like that either. But I'm glad you got some actual help from others. “Stay warm.” I was stuck in an airport! Freezing to death was not a possibility. “Travel safe.” I couldn’t travel! That was the problem. “It’ll warm up someday…probably.” Gee, thanks. All I wanted was a little sympathy and perhaps some “Don’t worry; you’ll get home in time,” even though there was no way people could know when or if I’d get home. Sometimes all we want is reassurance. Hopefully your wrist gets figured out soon. Envious of your workout routine. I really need to get back into it. How did you get started? LOL. I think that person may be the awkward one in the room. Sometimes it’s easy to feel that way when you’re in a corner with your own writing and someone else is asking for help. Personally, I’d chalk it up to someone feeling overwhelmed with their life and focus on the good parts.